Tailor made for the managerial staff in a working environment.If you’re looking to give your managerial office space a fresh, modern makeover, our range of cosy manager's chairs could be the ideal solution. As well as looking great, these vibrant chairs are ergonomically designed to provide maximum comfort and support during long periods of work. As well as breathable backs, many of our cosy manager's chair designs feature adjustable height, tilt and arm mechanisms for added flexibility. 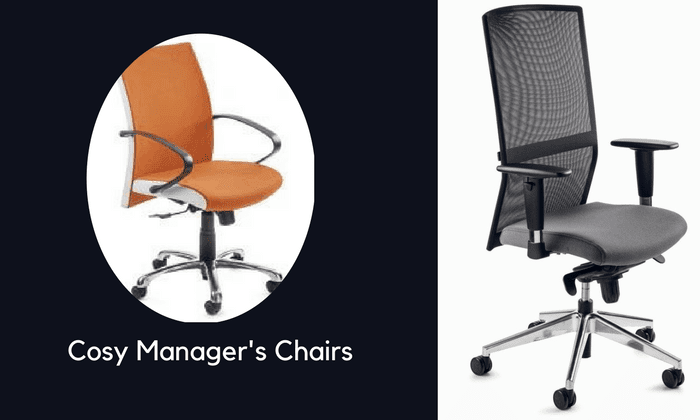 Manager office chairs are available in both operator and visitor styles and you can choose from a wide range of materials and colours to suit your individual requirements and budget. If you’re in need of a manager office chair, we encourage you to browse our elegant range today. To find out more information, don’t hesitate to contact us via email or phone. We will be happy to discuss your options with you and provide you with further details on any of our products. Highback Black mesh - Fully synchronous mechanism with gas height adjustment on arched Polished aluminium base with 60mm Dia. Twin wheel castors for carpeted floors. Complete with Poly chrome height adjustable armrest. COM - Please provide 0.75m for 1 seat or 1.4m for pultiples of 4 seats. Brolyn Midback Black mesh - Fully synchronous mechanism with gas height adjustment on arched Polished aluminium base with 60mm Dia. Twin wheel castors for carpeted floors. Complete with Zen Multifunctional armrest. COM - Please provide 0.75m for 1 seat or 1.4m for pultiples of 4 seats. Brolyn visitor's armchar- Cyber cantilever sleigh-frame in bright chrome finish.Steel-tube backrest (epoxy coated) covered in fine-weave Silver mesh. 9 x 1.5mm thick cross-laid plywood back with High density moulded foam & plywood seat with High density moulded foam. COM - Please provide 0.75m for 1 seat or 1.4m for multiple of 4 seats. Bellflower Highback - Fully synchronous mechanism with gas height adjustment on arched Polished aluminium base with 60mm Dia. Twin wheel castors for carpeted floors. Complete with Poly chrome height adjustable armrest. COM - Please provide 0.75m for 1 seat or 1.4m for pultiples of 4 seats. Bellflower Armchair- Cyber Cantilever sleigh-frame in bright chrome finish. Complete with armpads, moulded seat and back with two-tone fabric finsih. Bellini Highback Fully Upholstered Chair - Fully synchronous mechanism with gas height adjustment on Arched polished alu. base & 60mm Dia. Twin wheel castors for carpeted floors. Complete with Flexi armrest. COM - Please provide 0.9m per back & 0.7m for 1 seat or 1.4m for multiples of 4 seats. Bellini Midback Fully upholstered - Fully synchronous mechanism with gas height adjustment on Arched Black base & 60mm Dia. Twin wheel castors for carpeted floors. Complete with Fonte armrest. COM - Please provide 0.75m per back & 0.7m for 1 seat. Bellini visitors armchair Fully Upholstered - Cyber cantilever sleigh-frame in bright chrome finish. Complex bend steel-tube backrest fully upholstered. Plywood seat (cross-laid 9 x 1.5mm thick) & HD moulded foam. COM - Please provide 0.75m per back & 0.75 for 1 seat or 1.4m for multiples of 4 seats. Beltane Highback - Fully synchronous mechanism featuring 5 position lock & tilt tension adjust according to users weight/height. Gas-height adjustor on an arched black base (glass-fibre reinforced Nylon) & 60mm Dia. Twin wheel castors for carpeted floors. Complete with flex armrest. COM - Please provide 0.9m per back & 0.7m for 2 seats. Beltane Midback - Fully synchronous mechanism featuring 5 position lock & tilt tension adjust according to users weight/height. Gas-height adjustor on an arched black base (glass-fibre reinforced Nylon) & 60mm Dia. Twin wheel castors for carpeted floors. Complete with flex armrest. COM - Please provide 0.9m per back & 0.7m for 2 seats.